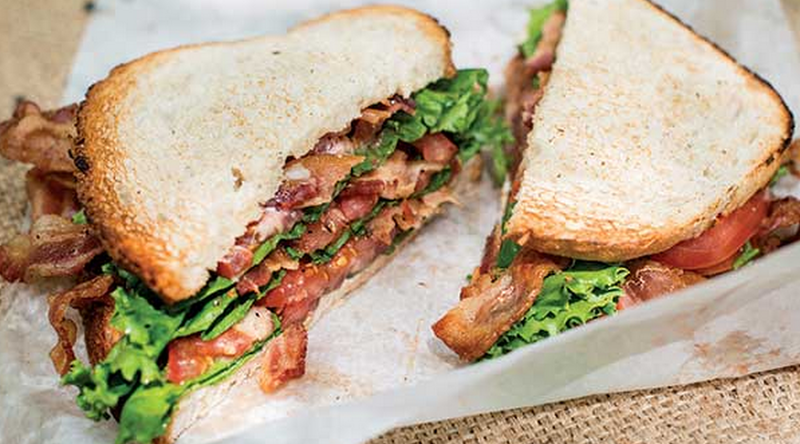 In the college town of Chapel Hill, North Carolina is one of the best bacon, lettuce and tomato sandwiches you will ever have. At Merritt’s Store and Grill you will find an old fashioned style sandwich shoppe that sets you back a few decades. When entering Merritt’s Store and Grill you will not be seated by a hostess. You won’t even see waiters or waitresses. You walk up to a cash register, with old fashioned refrigerators housing glass bottles of Cheerwine, creme soda and local beers surrounding it, and order, if you are smart, their classic BLT. A word of warning. If you go to Merritt’s on a Saturday or Sunday afternoon you are going to struggle to find a seat. There is outdoor seating and a picnic area out back but to find a seat in the building is going to be nearly impossible. There are only a handful of seats with one long table that often has several different parties that are eating together. I think there are only a total of 12 seats in the Merritt’s Store and Grill building. If it is raining or cold outside this is something to consider. Also, do not think you will be able to get in and out of Merritt’s quickly if you are stopping by for lunch during the week. Hundreds of UNC students invade Merritt’s on a daily basis as the location is walking distance from campus. Students that live near the UNC hospital know that it is just a hop, skip and a jump to Merritt’s. If you are driving to Merritt’s from Raleigh or Durham the best way to get to the best BLT in North Carolina is to take the Highway 501 exit off 54. You will know this is the exit because you will see signs for Pittsboro. After getting off the exit you will turn the opposite way of Pittsboro to head towards the UNC campus. When coming up the hill to Merritt’s I would suggest parking on the left hand side of the road. Recently, during a road project, a new gravel parking lot was put in across the street from Merritt’s. Instead of trying to squeeze your car in the tight parking lot on the right hand side of the road it is easier to just park in the gravel parking lot on the left. You have likely heard about Merritt’s Store and Grill on the WRAL Tar Heel Traveler or in the Our State Magazine. Southern Living Magazine even did a piece on Merritt’s. Recently they updated their website and it looks much better. At one point I think they had a Twitter account but I cannot seem to find it now. Please comment below if you know their Twitter handle. Many people ask why the BLT is so good. It is the freshness and the quality. It is quite obvious they use fresh lettuce and the best tomatoes in the area. The bacon is fantastic but is just the icing on the cake. Also, the perfect “toasting” of the bread makes it one of the best sandwiches you will eat in the state of North Carolina. If you have had Merritt’s BLT please feel free to comment below and let me know what you think. Was it the best BLT you’ve ever had? Reviews for Merritt’s are fantastic. Yelp gives Merritt’s a 4.5 star rating with 110 reviews. Trip Advisor also gives Merritt’s a 4.5 star rating with 37 reviews. Urbanspoon rates Merritt’s at 93% while Facebook users (234 votes) give the store and grill a 4.5 rating. What do you give Merritt’s? Do you think it is one of the best places to eat in the Raleigh, Durham and Chapel Hill area? Are you willing to travel to eat lunch at this popular location?